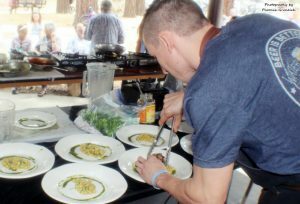 Halfway through the dessert round of last year’s Sierra Chef Challenge, Patrick Harrity still wasn’t sure what to do with the frozen peas staring back at him from the mystery ingredients box. Feeling the title slipping away, Patrick had a eureka moment and turned the frozen peas into a bright green caramel glaze to top his fried fritter desert with cranberry, white chocolate and whipped mascarpone. 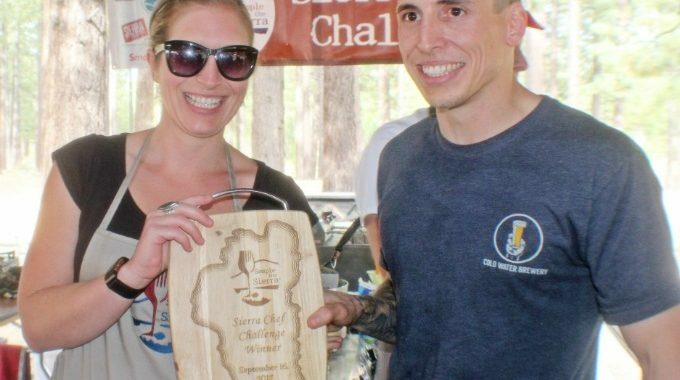 Turning his dessert in just in time, Patrick clinched the 2017 Sierra Chef Challenge title, helping Cold Water Brewery & Grill claim its third straight title. Below, Patrick discusses his victory last year and his plans to repeat at this year’s Sample the Sierra. Tell us about your background, where you are from and how you ended up being a chef? I grew up in the East Bay in the Antioch, Brentwood area. I took my first restaurant job as a teenager, working in a meat market, deli and barbeque-type place. I fell in love with cooking at this first job and cooked on and off for awhile. I went to college at Sonoma State and studied criminal justice. I made my way back to cooking and moved to Tahoe about six years ago. I started at the Glenbrook Country Club and just started working my way up the restaurant scene from there. How long have you been at Cold Water Brewery and what type of style are you trying to bring to the table there? I’ve been at Cold Water for two-and-a-half years now. I started as an assistant chef to Justin Kaplan (a reigning Sierra Chef Challenge winner, too) and took over for him about a year ago. As the executive chef, I’m really trying to push the food scene up here. A lot of restaurants in Tahoe just go with the standard fare and I’m trying to change that. I really want to be creative and emphasize fresh, local and sustainable ingredients. Was last year your first time competing in a chef-style challenge? Yeah, that was my first time. Totally! I had some big shoes to fill. Cold Water Brewery hasn’t lost the challenge since they’ve opened, so I definitely felt some pressure to bring the title back. Did you prepare for the challenge in any way? I binge watched Food Channel shows to try and learn some tips and put together a game plan. Of course, the second you open the mystery ingredients box (at the Sierra Chef Challenge), your game plan completely goes out the window and you have to adapt. Give us a play-by-play from the challenge last year—what did you make? In the appetizer round, the ingredients were dried cranberry, cherry pop rocks, quail, and another item. I made vinaigrette out of the cranberry and pop rocks, and put that over a wilted, charred salad. Then I took the breast off the quail and seared and honey-glazed it. And for the second round, we had a boneless pork chop, chickpeas, mango chutney, curry seasoning and maybe one other item. I prepared a curry chickpea for the bottom of the plate, smoked the pork and made a mango demi-glace for the sauce. I might be too hungry to ask, but what did you make for the final round? The ingredients included frozen peas, mascarpone cheese and white chocolate. The frozen peas threw me for a loop—it took me half the round to figure out what I wanted to make. I fried a fritter and topped it with dried cranberry from the first round, white chocolate and whipped mascarpone, and made a caramel from the frozen peas. What do you think set you apart from the field last year? I think the reason I won is because I used a lot of cooking techniques. I smoked, fried, seared and did everything that I could rather than just relying on one aspect. I also tried to set myself apart with my plating. I was really careful to make the plate very visually pleasing. What’s your favorite part of the Sierra Chef Challenge? I enjoy the competitiveness to it. I played competitive sports growing up, and it’s nice to still have an outlet for the competitive part of me. It’s also really cool to not only represent Cold Water, but to showcase my own culinary talents in front of an audience. How do you think the 2018 Sierra Chef Challenge is shaping up? I think the competition level is going to be higher this year and we’re going to raise the bar a bit. I can’t wait!